Do you want to improve your skills as a spearo? 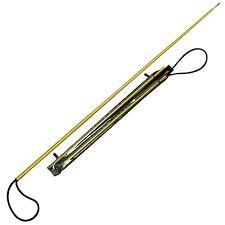 Try putting down your speargun and picking up a pole spear instead. 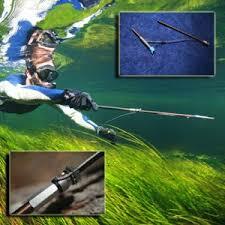 More experienced folk will recommend using a pole spear when you are first getting into spearfishing. This is not just good advice for those new to the sport. Even experienced spearos can benefit from boosting their spearo skill set, and pole spearing’s limited range tends to highlight any weaknesses you may have. Do you want to improve your skills as a spearo? Why don’t you try putting down your speargun and picking up a pole spear instead. 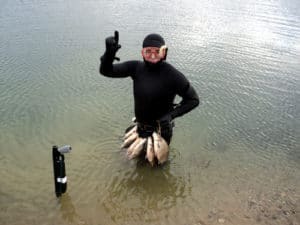 More experienced folk will recommend using a pole spear when you are first getting into spearfishing, but it’s not just good advice not for those new to the sport. Seasoned spearos can benefit from boosting their spearfishing skills set, and pole spearing’s limited reach tends to highlight any weaknesses you may have. What is a pole spear? Generally the pole is between ten feet and four feet long, constructed from fiberglass, wood, carbon fiber, graphite, or aluminum. Longer variants will often have bee able to break down into pieces, which fit together. The end of the spear will either have a threaded tip designed for a varity of spear tips, or it can be a fixed tip. Serious sportsmen kit their the pole spears with a slip tips, which is when tip comes apart from the pole but is tethered to to a fixed point. At the spear’s end is an elastic loop, which is usually constructed from a band of rubber, or surgical tubing. Starting out with a pole spear is a good idea as it helps teach you to get closer to the fish, which is a vital skill in hunting fish. To get a kill shot on a large fish, you need to get up close and personal, even with a gun. For example, if you see a fish and you dive towards it but your entry through the surface is too loud the fish gets spooked. If you are using a gun you may still be able to make the shot, but it won’t be easy and you risk not hitting he fish in the right kill zone. By using a pool spear you are forced to get close to the fish, which means you need to work on you “ninja skills”. This will also serve you well when you use a speargun later. A lot of spearos use the long range of their spearguns to make up for their weakness in getting near to the fish, which is the reason that pole spears are a great way to learn how to spearfish. Using a pole spear makes you to learn the basics, turning you into the most flexible and effective hunter. To get near enough with your pole spear, you need to know your fish. Every type of fish has its own self defense mechanisms as well and a distinct area from which a spearo diver may approach. A grouper for example could sit and stare at a spearo 20 feet away from him, right up until you approach. Within 10 feet the fish is instantly gone. The small hogfish, has the ability to changee color and camouflage itself. If you see it, you often have the chance to get up close and put the end of the pole spear up against it. Other types of fish, such as the cobia or the amberjack, tend to come swimming right up to you, begging to be stabbed by your pole spear. 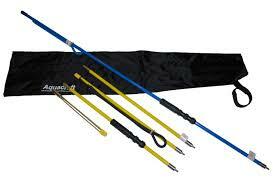 Research and experience are great modes of learning the fundamentals of spearfishing. There are many methods which benefit from the “closer approach”. An example would be an approach from above. This is another benefit to freediving over scuba spearfishing; a downward plan of attack tends to catch the fish offguard, as they are oblivious to the looming pole spear. The pool spears advantage in different surroundings. The usefullness of the pool spear in different surroundings is the most vital of the pole spear tricks and methods. While the spearo generally seeks free-swimming marks out in the open, the pole spear hunter can be found poking through the caves, holes, ledges, and other structures afforded but the wreck or reef. When you see that big snapper dart out from a hole and the dart back in again, you should swim up right behind the hole, waiting for his head to poke out again, ready the spear. The pole spear hunter should initially practice on free-swimming fish under circumstances where they may be more easily caught. 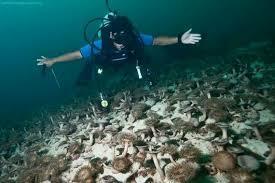 This is usually achieved with the bigger species such as Grouper or Hogfish. Bear in mind that fish generally prefer holes which have rear exits, so as soon as you see a chance to corner a fish into a hole, grab that it. Should they get cornered they become easy targets for the traditional hunter. The seconds directly after the strike, are when a lot of new pole spearos lose their catch. You should always put gloves on when you go spearfishing, enabling you to grab the fish as rapidly as possible. A lot of divers spear their fish and then end up holding onto the spear with the fish thrashing all over the place. This will often happen if you don’t shoot the fish behind the eye. A flailing fish can speedily displace a spear, so the key is to grab the fish right away and repress it before it shakes loose. Seize it solidly and string or bag your prey promptly. You should be holding your pole spear band between index finger and thumb, sliding your hand up the pole spear, which builds tension. Many divers like to wrap a band around the pole spear when pulling it forward, which creates a twist that rotates the pole spear as it propels forward. This will create friction, but it will also make the holding band less tense, which gets rid of flex in the pole spear and gives an accurate strike (http://www.foldspear.com/polespeartips). The slower/smoother you glide through the water the more likely you are to see bigger fish. Look around and move your head and limbs slowly. Fast movement attracts attention and will work against you. Use rocks, kelp, or any other surrounding to conceal your movement. If you see a fish hanging out by some rocks approach low from the opposite side. The rocks or structure will hide you as you close distance. Then come over the top and blast it. At the end of a dive don’t rush to the surface. Come up sooner than normal so you have enough air to do it smoothly. 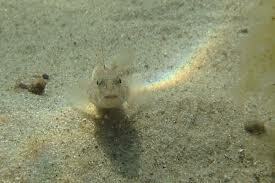 Fish can sometimes be inquisitive if you don’t frighten them. When you sneak up on a fish, if you don’t reveal all of yourself and do it slowly, you may get the fish to be inquisitive instead of swimming away. A tricky skill to master, this commonly results in the fish getting spooked and swimming away. However, that one time you get it right and that large fish just looks at you curiously before you catch it makes up for all the times the fish swam away. Seek fish in caves, near rocks, under ledges and in crevices. Fish frequently seek protection in crevices and underwater ridges, offering you the unique opportunity to creep up to the mouth of the cave, or to come above the ledge to catch the fish off guard. If you see a big rock, cave, crevice or ledge under the water, make an attempt to dive down and investigate. Always be primed to haul any fish you see, and you shouldn’t be astounded to find many of them hiding away. If you see fish on the ocean bed, dive straight down over it. When you see a fish from the surface, swim slowly towards it and aiming directly over it. Now, inhale deeply and take a dive directly for it. You have to us rapid motion, with the hope that the fish doesn’t see you until his time is already up. Fish will at times get skittish and swim away, particularly when they are moving together in a group, but this strategy will get you further than many others. Float your body on the surface of the water, and scan the bottom of the ocean for fish. Swimming in water which is between 10 feet and 20 feet or more deep, try to float on the surface, while gently using your fins to glide smoothly. Remain calm as you survey the bottom of the ocean. At times, the fish will be grouped together, feeding on the ocean bed, in which case they are providing easy targets. Other times it will not be so simple to find them, requiring you to look much harder under ledges and in cracks. Swim to deeper water of between at least 10 feet and 20 feet deep. Larger fish has a tendency to stay in deeper water, typically where the bottom is at a minimum 10 feet deep. Now this is where various swimming and breath holding skills come handy. If you are a really great swimmer, and can hold your breath for several minutes, you might want to go to even deeper water, nearer to 40 feet or more. If you are just getting into spearfishing and don’t really have much experience in free diving, then you want to keep it uncomplicated. Stay on a depth where you can easily swim to the bottom and back in one breath of air. A few good choices of pool spears. lProprietary Carbon Fiber Weave makes this polespear the stiffest on the market.